Houston’s metropolitan area is one of the largest in the United States. 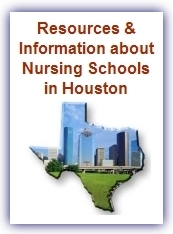 As a result, nursing schools in Houston, TX can be found in relative abundance. Some schools offer multiple degree programs, while others specialize in a specific type of degree, for instance, some community colleges will only offer LVN (Licensed Vocational Nurse Programs) certificates. Individuals interested in nursing degree programs, will be able to choose amongst the following Houston nursing schools. * Please note this merely a sample of all of the available options in Houston. Below, we will take a closer look at a few Houston nursing programs more in-depth. These schools offer a number of different nursing programs, essentially making them a one-stop shop for prospective nursing students and/or nurses that would like to obtain a higher-level degree. The University of Texas Medical Branch School of Nursing is one of the oldest nursing programs in the southeastern region of the country. Students accepted into the program will have the option of completing a BSN (Traditional, Accelerated and RN-BSN track), MSN or PhD. The school’s PHD is primarily online. Students are only required to visit campus 5 days each year. There are two transitional PhD programs offered at UT Medical Branch, the BSN to PhD and MSN to PhD program. Individuals will be able to obtain a Bachelor of Science in Nursing, Master of Science in Nursing, Doctor of Nursing Practice and Doctor of Philosophy in Nursing at the University of Texas Health Science Center. The school has been ranked as one of the top graduate schools for nursing in the country by the U.S. News and World Report. Lamar University is actually located in Beaumont, Texas, which is near but not in Houston. The Schools motto is “A spirit of caring-A vision of excellence and their stated vision is “Excellence in nursing education, in partnership with the community. Students will be able to obtain associate, bachelors or graduate degrees. There is a transitional degree plan for RNs that want to obtain their BSN. Individuals can also earn a graduate or Masters Degree. There are numerous nursing schools in Texas. When choosing one, individuals need to consider what type of degree or certificate they are seeking, the reputation of the school and whether or not the program is accredited. Cost will also likely be a factor. Only after considering the aforementioned, should an individual decide which nursing schools in Houston to attend.